Orangeburg pipe is a type of home sewer pipe used in most properties built from 1945 to 1972. Made of a mixture of hot pitch and wood pulp, these pipes are known for their structural complications after prolonged use. Once installed, standard Orangeburg pipes lines are expected to last 50 years time; however, many systems begin to falter after a mere 30 years of use. For systems installed in the late 60’s or early 70’s, this means pipe failure due to deterioration or structural issues may be imminent. If you are noticing decreased water flow, exceptionally high water bills or moist indentations on your property, it may be time to have your Orangeburg pipe systems inspected for damage. In this blog, we break down everything you need to know about Orangeburg pipe systems, as well as the best ways to repair or replace them when the time comes. Brittle, lightweight and easy to produce, Orangeburg pipe systems were produced solely by the Orangeburg Manufacturing Company following World War II, during the massive housing boom that ensued after the war. The fibrous, wood-and- pitch composition pioneered by the Fiber Conduit Company in the early 20 th century, made Orangeburg pipe an affordable alternative to other iron or clay pipe lines (this led to its broad use in mid-century America). Typically made with diameters between 2 and 18 inches, Orangeburg fell out of popularity in the early 1970s, as more reliable, efficiently produced pipe materials became available. While provided a life expectancy of 50 years, many Orangeburg pipe systems were susceptible to failure in as little as 10 years, due to the brittle materials used and poor structural strength. Now obsolete, Orangeburg pipe systems are still present in many older home models, slowly giving way to the pressures of time. In these cases, taking a proactive approach to Orangeburg pipe repair can prove more effective than waiting for systems to finally fail. Generally, Orangeburg pipe damages occur naturally with time (due to their fiber- based composition). Over several decades, the pitch and pulp bonds that hold Orangeburg pipes together will begin to fail. In this case, there is little you can do to restore existing Orangeburg pipe; replacement to some degree is typically necessary. Fortunately, Churchwell Plumbings pipe repair innovations have made replacing your aging Orangeburg systems not only quick, but also affordable for almost any budget. The secret lies in Churchwell Plumbings trenchless pipe lining and pipe bursting method, which can be done through existing sewer entry points or noninvasive boring holes. There is no longer any reason to physically excavate and replace aging Orangeburg pipe systems. 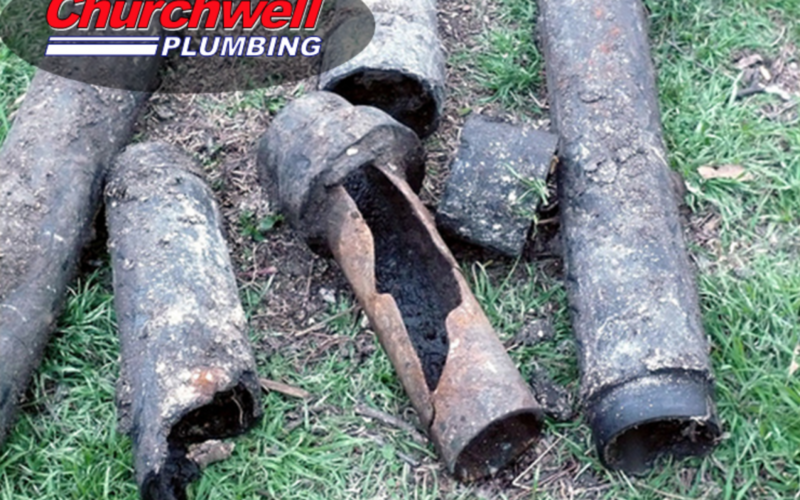 Trenchless repair solutions allow Churchwell Plumbing to reinforce and re-pipe your home without the costly digging and property damage of traditional pipe repair. During pipe lining, Churchwell Plumbings trenchless experts will coat the inner walls of your faltering Orangeburg pipe with an epoxy-resin lining mixture, and physically cure this lining in-place (hence the name, “cured-in- place pipe”) using a pressurized air bladder. In a matter of hours, this resin will form entirely new pipe structures within your aging, damaged Orangeburg, and retain a smooth internal surface through pressurization. By eliminating the need to physically dig out your damaged pipe line, you keep labor to an absolute minimum, and avoid any costly, stressful landscaping renovations. This lining application is ideal for virtually any type of pipe damage, whether it’s cracking due to temperature change, fracturing at critical pipe joints or deterioration with age (often the case for Orangeburg pipe systems).